(Bagamoyo) Ifakara Health Institute (IHI) officially launched its master’s program in public health research on Friday afternoon February 8 2019. Hubert Kairuki Memorial University Deputy Vice-Chancellor, who is also IHI Board Chairman, Prof. Charles Mgone, graced the ceremony. The half-day launching event at the Institute’s Kingani Training Center in Bagamoyo, Coast Region, was highlighted by a panel discussion around four topics: research as a driver for health and wellbeing; public health research for a healthy Tanzania community; public health research towards achieving sustainable development goals (SDG); and, investing in public health research training for skilled minds. 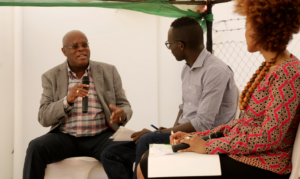 Ms. Maria Sarungi, a prominent Dar es Salaam-based public communication specialist, moderated the discussion and she was joined by two panelists: Prof. Mgone and IHI Director of Science, Dr. Fredros Okumu in an impressive and moving discussion. The program, the first of its kind to be taught in Tanzania, is named “Master of Science in Public Health Research (MScPHR),” and is run by the Nelson Mandela African Institution of Science and Technology (NM-AIST) in collaboration with the IHI. The first students commenced studies in January last year. IHI Chief Executive Director, Dr. Honorati Masanja, told the event gathering that the difference the program would make in public health training is the type of graduates it will produce. “They will be equipped with strong practical research skills and the ability to apply these skills at any level of the health system,” he said. He expresses commitment that IHI and partners are determined to develop the next generation of innovative public health research scientists who are much needed by stakeholders in the public health arena (government departments, NGOs, research and academic institutes). NM-AIST Deputy Vice Chancellor charged with Academic, Research and Innovation, Prof. Anthony Mshandete, said his institution was keen on generating graduates who contribute to changing people’s lives. He expressed optimism that this particular program would do exactly that by producing the next generation of public health researchers capable of impacting positively on the lives of the Tanzanian communities and beyond. The program name is “Master of Science in Public Health Research (MScPHR),” and is run by Ifakara Health Institute (IHI) in collaboration with the Nelson Mandela African Institution of Science and Technology (NM-AIST). The Tanzania Commission for Universities (TCU) accredited the programme in 2015. The MScPHR is a two-year program comprising 12 months of coursework and 12 months of research. Courses are offered at the IHI’s Kingani Training Center in Bagamoyo District, Coast Region by staff from IHI and NM-AIST. The program is suitable for aspiring researchers, academicians, health program evaluators and health program managers with potential to provide students with extensive knowledge, subject-specific expertise, specialized and functional research skills and global network from a diversity of facilitators that are needed to further their career in public Health. The program is open to candidates with appropriate first degrees in life sciences, social sciences. Since its establishment in 1956, Ifakara Health Institute (IHI) is at the top of delivery of health research, training and services locally and internationally. The Institute has a mission of developing and sustaining health research capable of generating new knowledge and relevant information for public health policy and action. It has emerged at the top in competitive grants and offers scientific technical support locally and internationally. IHI is a world-class Institute committed to excellence and high technical standards in all its work. It’s a platform for outstanding health research where scientists participate in top flight global research collaborations, and has been very effective in contributing to the welfare of the community in Tanzania through its work using the Institute’s Community Engagement Unit. IHI scientists work across biomedical & ecological sciences, interventions & clinical trials, health-systems and policy. The Institute’s work has been useful in addressing key health challenges in Tanzania and globally such as malaria, tuberculosis, and HIV through various studies which have resulted into changing or influencing local and global policies. IHI is a non-profit outfit registered in Tanzania which is headquartered in Dar es Salaam with branches in Bagamoyo and Ifakara – the Institute’s birth place. The name Ifakara refers to “a place you go to die”, a reflection of the historically high burden of disease in the area, before major control efforts started. NM-AIST is a fully-fledged university established under the Tanzania Universities Act No. 7 of 2005, fully registered with TCU with Reg. No. 028, and with a Charter granted by the former President of the United Republic of Tanzania on August 13, 2013.